• Full bypass with fully-balanced hot/cold switching. Fully passive. 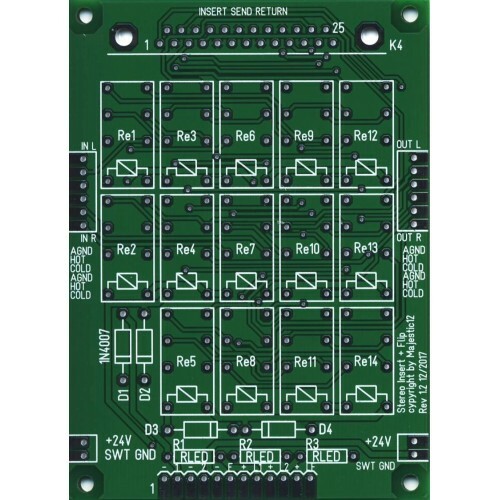 • Ideal for overall Precision MS Board Bypass or MS Insert. • Backbone connection may be split to provide two independent full bypass sections. • Backbone signal flows through the connections on the left to the right. 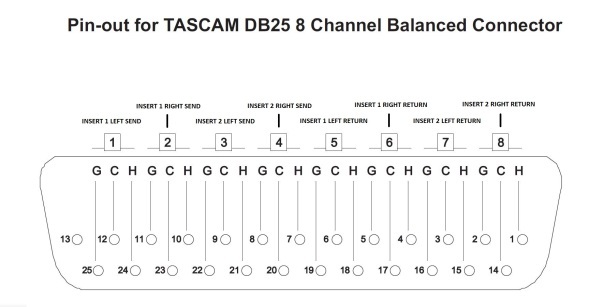 • Insert connections are on the 25 pin D in a modified Tascam format. • Normal signal flow is Left/Right In > Insert 1 > Insert 2 > Left/Right Out. • Flipped signal flow is Left/Right In > Insert 2 > Insert 1 > Left/Right Out. • Cascadable using additional boards in series for more inserts. • Current-limited LED tally outputs are available. • Isolated audio, relay and chassis grounds. • Series-parallel coil connection to reduce switching currents. • Coils are 12V, control supply is 24V. 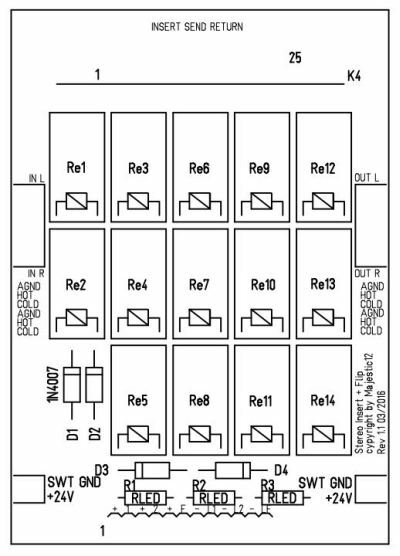 • Approximately 140 mA @ 24V max using high-sensitivity 12V relays. • Assembled units use sealed low signal current relays. • Powerable from +/-15V supplies using an external 7824 or LM317 regulator. 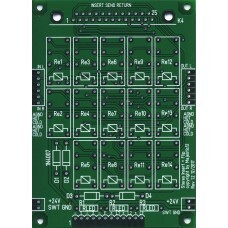 • Ideal for MS Matrix Insert/Bypass. The construction thread for the Insert Switcher including, schematics, bill-of-materials and other information is in the Pro Audio Design Forum.